Gingerbread cupcakes? 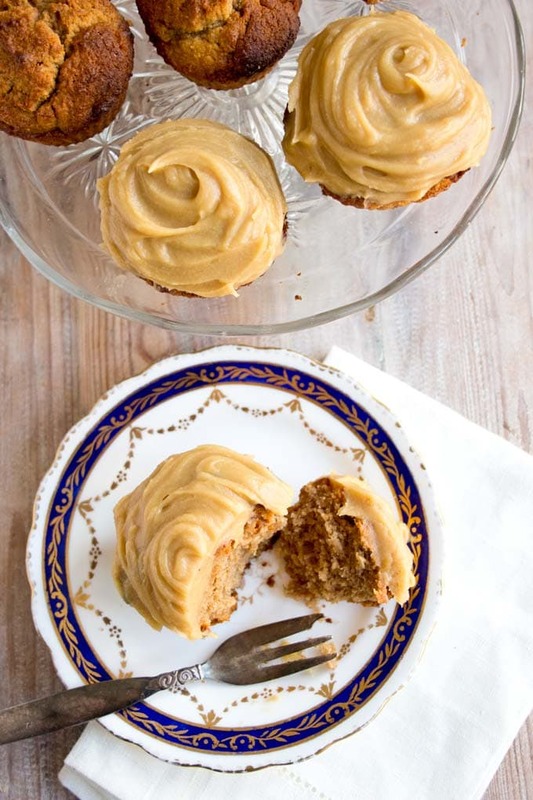 With lashings of salted caramel frosting? Ooooooh, yessssss. Im going for full-on decadence with this one. It’s November. Too early for Christmas parties and too late for Ibiza. It’s grey and windy outside. My bed is calling me from around 3.30 pm onwards. I’m in full-on hibernation mode and I need some serious cheering up. Are you feeling my pain? 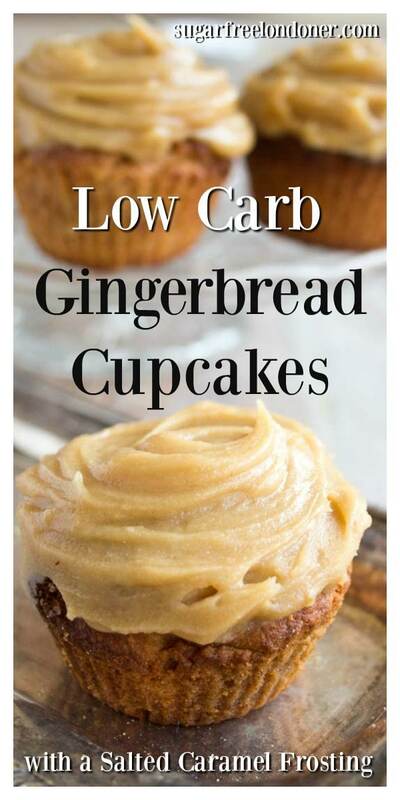 Enter these low carb gingerbread cupcakes! First, the spices. Ginger, cinnamon and nutmeg. Think of all those wonderful festive scents that will waft around your kitchen while these babies are in the oven! And while the cupcakes taste wonderfully moist, soft and totally satisfying on their own with that extra kick the spices lend, the frosting turns it up another notch. Salted caramel frosting! So addictive you could eat it with a spoon. I did, actually, under the pretence that I had to taste whether it was JUST RIGHT. Amazingly, it just kept getting righter. I did it for you, dear reader, in the name of recipe testing. My job does have its perks. 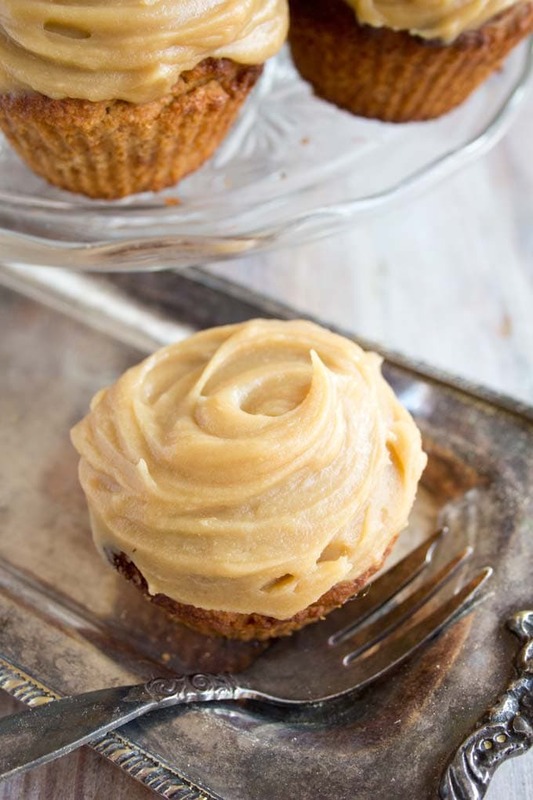 This is the best salted caramel frosting I’ve ever repeatedly tasted, and it made my gloomy November day. 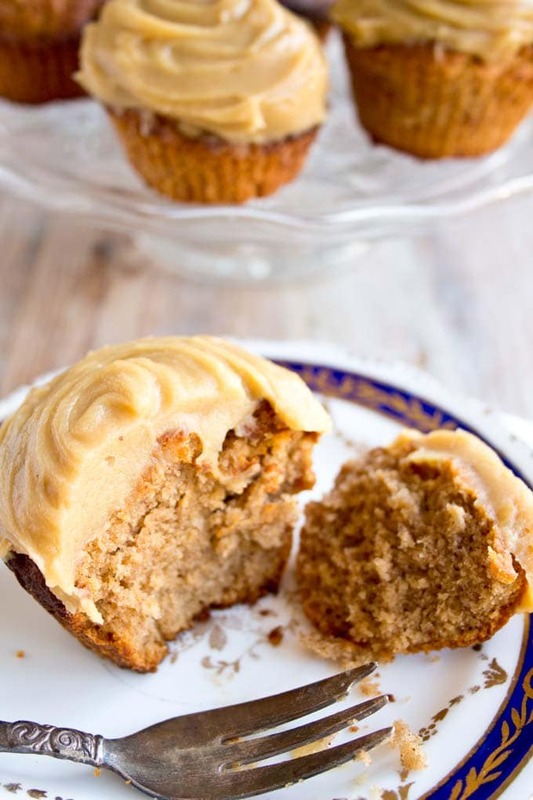 How do you make these addictively good gingerbread cupcakes? 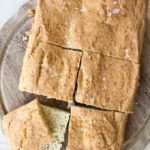 I used a mixture of almond and coconut flour for this recipe. 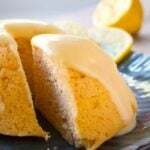 The combination gives a nice fluffy cupcake consistency and you cannot taste the coconut flour, which some people do not like. 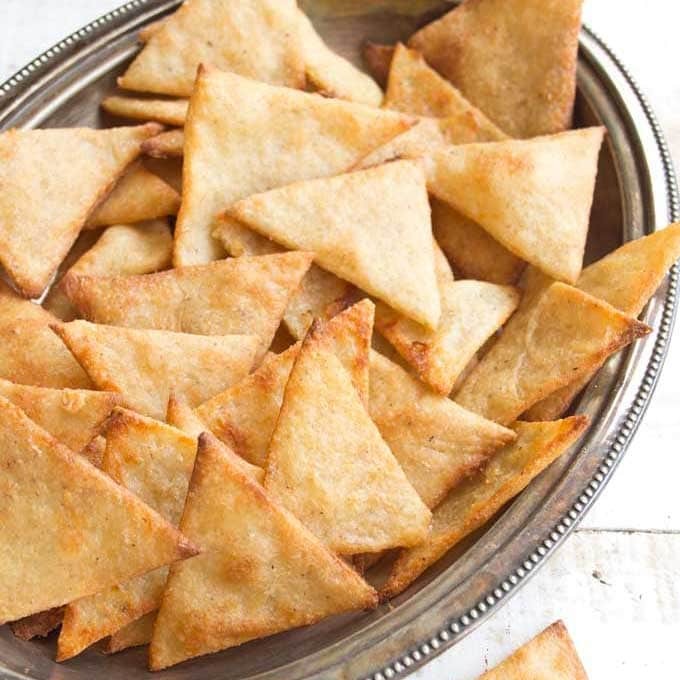 When I did a second batch, I started to run out of almond flour, so replaced 50% of the almond flour stated in the ingredients with blanched ground almonds. This also worked fine. The coconut flour versus almond flour debate keeps on raging and there are many people who love one and hate the other. I actually like both, and use them all the time. 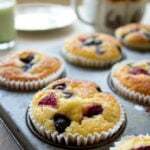 If you are camp coconut flour, check out these sugar free chocolate feast muffins or these coconut blueberry muffins. If you root for almond flour (or ground almonds), these grain free English scones could make you very happy. 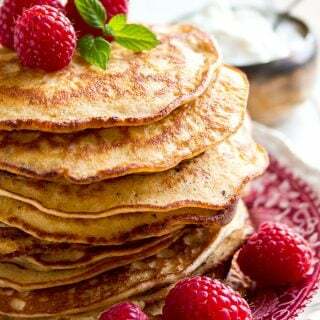 I decided to use two different sweeteners in this recipe – a brown sugar alternative and a sugar free syrup. That’s because I wanted to re-create the rich treacle/golden syrup taste regular gingerbread has. If you do not have a sugar free syrup to hand, you could replace it with more granulated sweetener (ideally a brown sugar alternative), but in this case I think you should add a couple of tablespoons of liquid such as strong coffee or chai tea to get the dry/wet ratio right. On another note, I saw on Amazon that you can buy treacle/molasses flavour concentrates, which I’m keen to use next time. Anyone ever try one of these? Let me know in the comments. I’m sure they would be a great addition to the recipe. 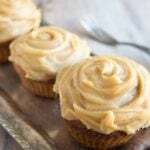 The salted caramel frosting is an adaptation of my popular 2 ingredient sugar free caramel sauce. Basically, I’ve made it even naughtier and creamier by using butter and cream. 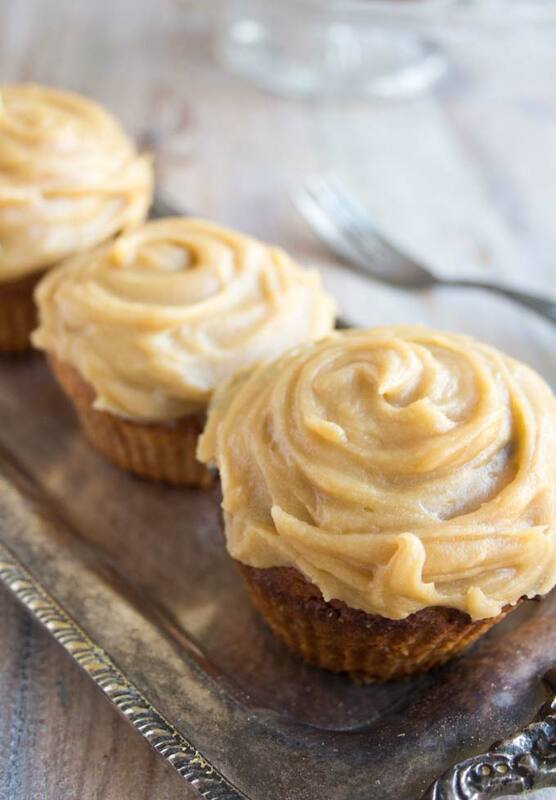 When you bite into your very own low carb gingerbread cupcakes, you’ll know what a good idea it was to lather it on top. The moment those mellow caramel notes and the spicy kick of the ginger and nutmeg start mingling in your mouth will be like a ray of glorious sunshine on a gloomy winter day. Bring on more rubbish weather, please! 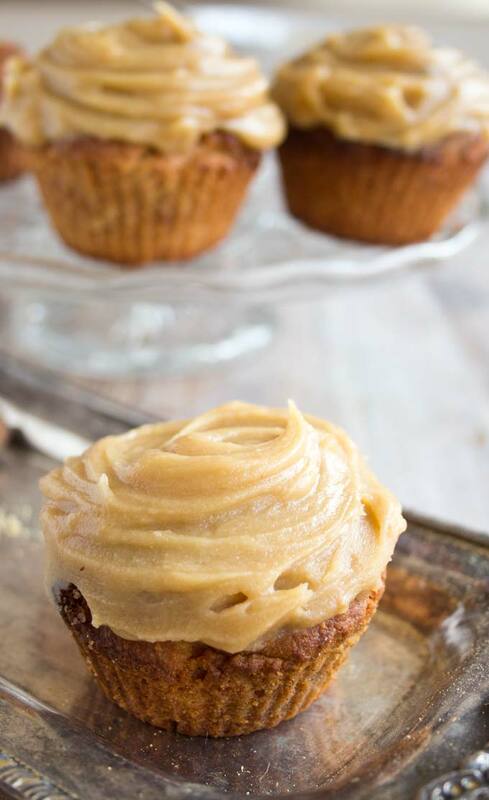 Low carb gingerbread cupcakes with a sugar-free salted caramel frosting - a finger-licking-good treat suitable for sugar free, gluten free and low carb diets as well as diabetics. Preheat your oven to 175 Celsius / 350 Fahrenheit. In a food processor or with a blender, mix the butter, granulated sweetener and sugar free syrup. Add the eggs and blend. Add the dry ingredients and spices and blend until smooth. Fill into 8 paper or silicone cups (I used silicone cups which I greased with butter, just in case) and place in a muffin/cupcake pan. My batter was quite thick - it softens as it heats. To prepare the frosting, heat the cream with the fibre syrup in a small pot and let it bubble over a medium heat until it reduces - around 5-10 minutes. Stir in the brown sugar replacement, add a pinch of salt and let the mixture cool. Keep stirring from time to time. Once the caramel is only lukewarm, whisk it into the softened butter. Let the cupcakes cool completely before you decorate with the caramel frosting. I had the oven on 190 Celsius in the beginning, that's why my cupcakes browned a little too much on the top. I reduced the heat to 175 Celsius as soon as I noticed. If you set your oven to 175/350 Fahrenheit, yours should come out perfectly. I was looking at the Sukrin Gold products in your recipe and they both have barley malt extract..made here in the U.S. at Sukrin USA..so how is this gluten free? I know the UK has different standards as far as barley malt extract and labeling requirements, but that isn’t the same here in the U.S. This product would be considered glutenated here in the U.S. Is there a truly gluten free alternative for these ingredients in your recipes? You could use another sugarfree syrup, for example the one by Lakanto. I didn’t have Sukrin Fibre Syrup, so I used Lakanto Maple Flavoured Syrup, it’s Sugar Free, Monk Fruit Sweetened. It’s Keto.Such a delicious recipe. 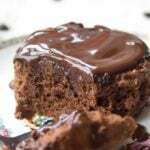 Thank you Katrin, love your blog, such healthy and tasty recipes. Thank you so much Wanda! The maple flavour must have worked a treat with the gingerbread taste. Does the nutritional label include the frosting as well as the cupcakes? If so, I would love to have it for the ‘cakes by themselves. My hub doesn’t like salted caramel, so I thought I’d use a tart lemon/cheesecake frosting, instead. 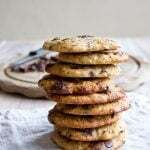 This recipe sounds so yummy and easy to make! Hi Kaerze, I did a quick calculation of the frosting and 1 portion is 161 calories and 0.8 net carbs, which you can deduct from the total. A cream cheese frosting would taste great with it! great recipe! Made this yesterday and all are gone. Definitely a keeper!! Unfortunately the frosting didn’t work for me, I tried it twice. The first time the mixture in the pan set rock hard so I reheated it to turn it back to the syrup consistency. The second time, although the mixture was like warm, it melted the butter. Both times I tasted it but it was like a sweet butter with little flavour. It wasn’t like a butter frosting/butter cream I am used to. 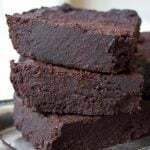 I am in UK and used all the products as in the recipe and the metric quantities. Yes, the cake was delicious. I had it with cream. Thank you. Oh that’s good to hear. Have a good Sunday! Hi can I ask where you got those ingredients in the UK? You can buy them directly on the Sukrin website. You can also get coconut flour and almond flour in health food stores such as Planet Organic. 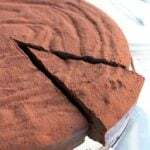 Hi, I have a question about almond flour: do you use the very finely milled flour, or the coarser version which you can also make at home in a food processor/ coffee grinder? I feel the first would need more liquid than the other, or is it interchangeable? What can you use in place of Sukin Fibre Syrup? 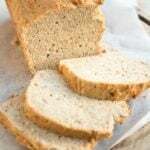 Could you make a Flax syrup or some other kind of fibre like Psyllium husk powder? This syrup actually has the same consistency as golden syrup or runny honey. It is made of a plant fiber called isomalto-oligosaccharide. If you used psyllium or flax instead, your cupcakes would end up too dry. Hi Danielle, Sukrin Gold is the brown sugar replacement, it’s granulated. The syrup I used is the brown one. They are both not cheap, but will last you a long time. Happy baking! You can definitely freeze the cupcakes. The icing I would prepare and add once you defrost. Delicious! I made these as soon as I saw the recipe. Set the oven to 175 Celsius as instructed and they came out just fine. I also added a couple of tbsp of brewed espresso. Will definitely make another batch before Christmas. thank you for the inspiration. You’re welcome Rose! I’ll have to try using some espresso in them next time. And that treacle flavouring I saw on Amazon. Glad you liked them. love this idea!!! one question, if I can’t buy ingredients in the store, I usually skip but if I can find reasonable alternatives, I use those. So, I use Ideal sweetener (xylitol) for any sweeteners and it’s worked well. Would Sukrin fiber syrup be thin like a coffee syrup or thick like a maple syrup? 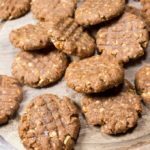 Is Sukrin Gold a low carb version of brown sugar? Hi Dawn, the Sukrin Syrup has the same consistency as maple syrup. And yes, the Sukrin Gold is a sugar free version of brown sugar, it’s a stevia/erythritol mix. If you don’t have a brown sugar alternative, maybe browning the butter or using a caramel concentrate would also give that “deeper” flavour. Can we use honey as syrup alternative? You would be fine in terms of sweetness. It would change the taste though I guess – in traditional gingerbread, you use golden syrup and treacle/molasses to get that deep flavour. The syrup I use tastes like golden syrup. Maybe maple syrup would work better than honey?